Example of our Printed Circuit Board, manufactured completely in house. We operate Artos CS-26A and Eubanks wire automatic wire strippers and Amp K press for wire termination. 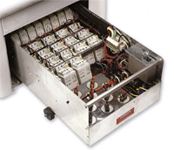 We specialize in sheet metal assembly and electrical wiring. Below is a sample of our work and wiring cabapilities.